Noise Canceling Curtains: Is This a Real Thing? Whether it is the endlessly barking dog two houses down that seems most agitated and starved for attention at night, or the standard street noise of the big city below, it is vital that you are able to relax in a quiet space when you are in your home. After a long day, there is nothing worse than unforeseen disturbances. All day you looked forward to coming home to unwind, and now you cannot. This is one of the more frustrating parts of living amongst other humans, but don’t let your agitated state inspire rash behavior. Certainly, it is important to trace the source of the noise, but in most cases the solution does now lie with the noise itself. Sure, you can talk to your neighbor about their dog, but it is likely that said owner has about as much control over the barking as you do. So what do you do? Finding the source of noise serves the purpose of informing the place in your home that needs noise canceling. From there, you can start to explore how. One such way that has become popularized amongst noise cancelling products is the phenomenon of noise cancelling curtains. It is hard to imagine how a curtain, something that is not structural or encompassing of a window or door, could possible cancel noise. The truth is, it likely will not, and as such, the term noise cancelling as it pertains to curtains is a bit of a misnomer. There are, however, some decent products best described as noise dampeners. In this article, we outline the characteristics that make for effective noise dampening curtains, and the five best products for turning down the volume during your down time. Before you click the buy now button, it is important to consider the characteristics of any material, not just curtains, that help it reduce external sound. First and foremost, the height, weight, and width of the material will go along way in helping you determine potential effectiveness. A heavier material will muffle sound more so than a medium weight material will. But weight is deceiving if it is not distributed across the surface of the material, which then must cover as much of the window overlooking the noise source as possible. The most effective noise cancelling curtains are both heavy, and tightly woven. Look for words like layered in the product descriptions. These will be your best bet. Also, it is helpful to know the dimensions of your window so that you can make an informed decision regarding height and width of curtains. To cancel or muffle noise, the curtain should be a few inches larger than the opening of the window on all sides. 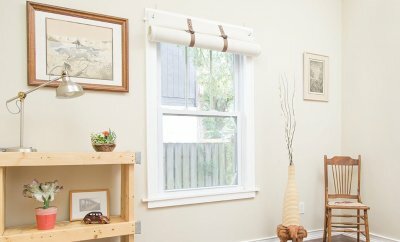 While no curtain will fully seal over a window, you want to find a curtain with folds that sort of mimic a seal in the way they fall. This will be hard to find out before ordering, but a call to the manufacturer should get you this information. Also, Amazon reviews are pretty enlightening. Search the curtain brand in google with your review topic and you may find the answer to your question. The first two products on the list are marketed as noise cancelling curtains. It is for this reason that they are priced so much higher. Each brand is patented and lab-tested. The last three products on the list are blackout shades that offer noise reduction as a benefit, which is the reason for the lower price point. These curtains have made the list for their reviews concerning noise cancelling capabilities. The Moondream brand boasts 3-in-1 sound blackout thermal insulation. This technology is patented, which is always a good sign. The curtains are available on Amazon in four sizes and twelve colors. 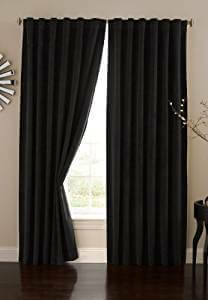 This is a layered curtain that is room darkening as well, and claims to insulate from heat and cold saving energy costs. These thermal, blackout curtains come in three sizes and two colors. While the options are slightly more limited, they are also patented and made of a canvas material rather than layered fabrics. Residential Acoustics does NOT guarantee sound cancellation, but rather claims noise reduction by up to 90%. These thermal curtains are made from 100% polyester as a part of a laboratory-tested fabric construction that also insulates against heat and cold. They are room darkening as well, and come with rod pockets and back tab for a couple hanging and styling options. The best part of these shades are the size and color options. 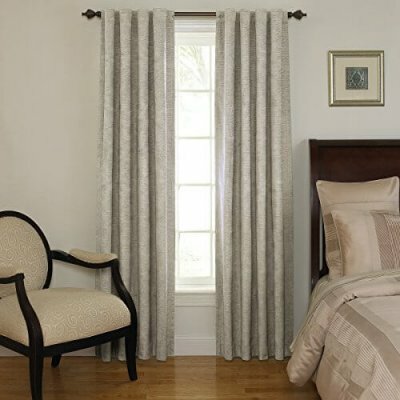 Best Home Fashion Curtains come in eight sizes and thirty colors. Absolute Zero Velvet Blackout Curtains come in ten sizes and four colors. They are also 100% polyester and made to emulate theatre curtains. These curtains are blackout and have thermal benefits as well, but the biggest upside to these is the ease of care. Absolute Zero curtains are machine washable, and ironable. This brand does not advertise itself as noise cancelling but rather lists noise reduction as an ancillary benefit. Beautyrest Curtains come equipped with rod pockets and back tabs. 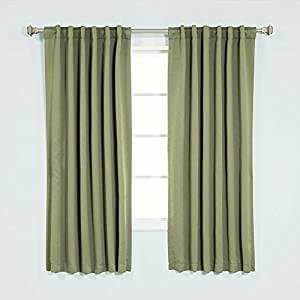 They are curtains meant for single windows and come in six sizes and six colors. These are also polyester and machine washable. 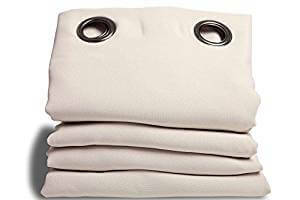 They are also machine washable and have a 3.5 star rating on Amazon. These are not advertised as noise cancelling, but reviews support the notion that they definitely do the job of reducing external noise. There you have it! The five best curtain brands for noise cancelling or reduction. It is important to consider size of windows as you shop, noting your own window sizes against what each product offers. All are layered or insulated in some way, and all have added benefits like energy saving and darkening capabilities. Remember that not all of these claim to be noise cancelling, but that they have received reviews that have noted this as a benefit. This is the reason for the disparity in price point. It is not a bad idea to start with the lower end curtains, meant specifically for darkening, to see if they do the job of muffling some of the racket you’re facing at home. If you still can’t get your rest, you can always stash them away and spring for the heavy artillery curtains like Moondream or Residential Acoustics.